Pres. Moon expresses high hopes for Hanoi summit. February. 12, 2019 07:57. weappon@donga.com. “Harnessing this opportunity, the first of its kind since the separation of the two Koreas, would enable us to escape the threat of war for good and build an economy where peace is rewarded,” South Korean President Moon Jae-in said about the prospect of the second summit between Washington and Pyongyang. 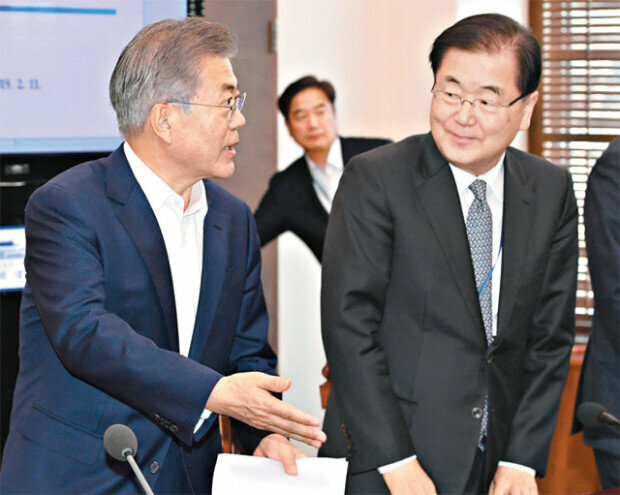 The remarks came during Moon's chief-secretaries and aides-meeting, over which he presided on Monday, while paying respect to the decisiveness of the two leaders who are trying to cross the deep waters of distrust that has persisted for 70 years. “I expect that (the second U.S.-North Korea summit) will be a crucial turning point to make a more concrete, tangible progress towards achieving a complete denuclearization of the Korean Peninsula, redefining relations between the U.S. and North Korea, and bringing peace to the peninsula,” said the South Korean president. A sense of expectation was felt that the upcoming meeting in Hanoi will produce a step towards denuclearization going beyond dismantling Yongbyon nuclear facilities as well as reach a “big deal” encompassing a declaration of end of war and a roadmap for peace agreement. “The event bears more significance as (the summit) could turn out to be a critical chance to take inter-Korean relations to a new height,” said President Moon, stressing the need to usher in a new era of peace economy where peace can drive economic growth. The president’s remarks reveal his strong determination to take the upcoming events – the Hanoi summit and Kim Jong Un’s Seoul visit – as an opportunity to bolster inter-Korean economic cooperation. “It appears many people still want the times of hostilities and conflict to continue. I sincerely ask the people of this country and policymakers to stay in harmony,” urged President Moon. He argued that his administration has always kept the channels open for inter-Korean communication and made close coordination with Washington, vowing for the administration to fulfill its roles with a sense of stability. However, President Moon’s phone call with U.S. President Donald Trump is likely to be arranged sometime next week, after assessing and reporting the result of the working-level negotiations between U.S. envoy Stephen Biegun and his North Korean counterpart Kim Hyok Chol. Washington and Pyongyang will have follow-up talks in Hanoi next week.